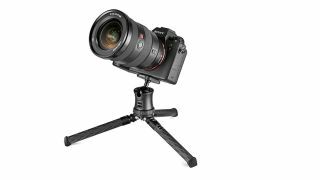 Most of us dream of owning a Gitzo tripod... with this new table top model your dreams may not only come true, but the mini support is small enough to take wherever you go. The Gitzo MIni Traveler is hailed to be the world's most compact professional-grade carbon fibre tripod. Aimed at high-end photographers, who wish to travel light and most frequently make use of medium-sized optics on their DSLR or mirrorless camera (take a look at our list of the best travel cameras right now), the Mini Traveler benefits from the same precision-engineered carbon fibre and aluminium structure as other tripods in the Gitzo range. The materials are treated using a special anodic oxidation processes for added durability. Weighing just 265g with the supplied aluminum Mini Traveler GH1382TQD ball head attached, and can support a maximum payload of 3kg. The legs can support 25kg if the head is removed. This makes the newcomer ideal for placing secondary remote cameras in crowded environments, such as sports games or for performance photography, where the photographer wishes to capture unique shots from the sidelines or wings. The legs have removable rubber feet. The legs themselves can be adjusted into two positions for maximum versatility, with changing between angles made easy through the implementation of a new leg lock system. The shooting height can be varied from a maximum of 17.5cm down to 5.3cm. The design of the Mini Traveler is unmistakably in keeping with the Gitzo philosophy and is available in two colour options, when paired with the standard head - all black or with silver highlights on the head itself. Overall it seems the Mini Traveler is the perfect companion for Gitzo fans or perhaps as an entry into the entry into the exclusive Gitzo club. The Mini Traveler (model number GKTBB) has a recommended price of £189.95/$199.99 with the GH1382TQD ball head.